One of the interesting developments to come out of the National Association of City Transportation Officials “Designing Cities” conference (currently in its second day) was the announcement of a wide-ranging new design guide to be released next year. NACTO’s “Urban Streets Design Guide” will show how streets of every size can be re-oriented to prioritize transit, safe walking and biking, and public activity. These innovations are at the center of improvements for urban roadways in the U.S., but they are still often treated as marginal or exceptional by other national design guides. This guide will fill that gap and give cities the tools they need as they strive to make the most of their streets. The full Urban Streets Design Guide is slated to come out in March. For now there’s a short overview and some excerpts online, which give a sense of what will be in the finished version. When it comes to re-engineering streets, the importance of this type of design guidance is hard to overstate. At a panel yesterday afternoon, Seleta Reynolds of the San Francisco MTA’s Livable Streets program shared a terrific example of how the NACTO bikeway guide helped accelerate change at her agency. The NACTO book provided guidance on the specifics of protected bike lanes, she said, like how wide the buffer should be and how to design the “mixing zones” where cyclists and turning drivers interact. None of those details are included in the engineering guides that loom largest in California — the state’s version of the Manual on Uniform Traffic Control Devices (MUTCD), and the state DOT’s Highway Design Manual. Whenever the SF MTA implements a design that isn’t covered in those two documents, the agency is required by law to obtain permission for “experimentation,” which can be an onerous process. That’s another way the NACTO guide has helped expedite projects like the JFK Drive protected bike lanes — Reynolds and her team use it to demonstrate that they are following standard engineering practice. With the NACTO bikeway guide and San Francisco’s Better Streets Plan providing standards for bike and pedestrian improvements, Reynolds said, she’s looking forward to the multi-modal treatments in the Urban Streets Design Guide, which will help shape decisions about the many streets in her city that can work better for both transit and bikes. “Mixing zones” where motor vehicles are going more than 20mph have been discarded in Dutch design, e.g in the CROW guide – and this issue is discussed in A View from the Cycle Path — but no matter how many times one says this in Streetsblog comments it never makes it into articles about cycling and other street infrastructure. Ben you’re absolutely right that “When it comes to re-engineering streets, the importance of this type of design guidance is hard to overstate.” If the importance of a Streetsblog story was reflected by the number of comments it generated, the NACTO Street Design Guide would have 1,000 comments. This is a big deal and part of the quiet side of the tidal wave of positive change that Jon Orcutt, Bruce Schaller and Janette Sadik-Khan have unleashed in NYC, and that’s now rippling across the country. You’re right that the Dutch know how to do this all so much better. So little by little we are catching up with what they discovered forty years ago. their expertise is transparent and accessible. old computer, and you can get a new one! Just like the Dutch (or anyone with reasonable resources). In these discussions I very often a response which is something like “the Dutch are better but we’re not there yet.” So I like to use a cancer cure analogy: Imagine – and it may well be true – that US cancer research is ten-years ahead of what they do in Europe. Would the EU have its own “cancer guide” which ignored most of the best practice in the U.S.? Policies that affect street use are made in a highly political context. The NACTO guide is an attempt by the big US cities to liberate themselves from the state and federal transportation bodies that are completely dominated by a car-first, suburban mindset. Holland is wonderful. It’s also tiny, and culturally and politically homogeneous compared to the US. 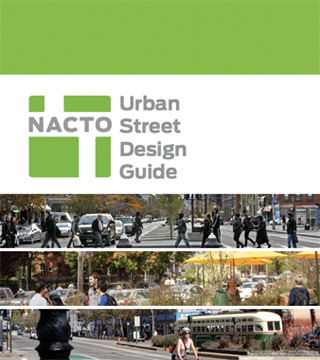 The NACTO guide can evolve very rapidly — after it’s been adopted and validated through use. The cycle track/protected bikeway has gone from essentially unknown to well known in a few short years. Focusing on a few drops misses the ocean of change that’s been set in motion as urban street designers can finally escape from the straight jacket of the AASHTO Manual. If you could actually get a copy of the new AASHTO Bike Guide you’d see that there are plenty of good facility options in it. It is my understanding that everything in AASHTO guides are independently peer reviewed before it is put into a guide. This takes time. Don’t diss the AASHTO guide out of hand. Okay, you are free to diss the lack of access to it. There is a bizarre divergence in the way AASHTO is applied, in my experience. For automobiles, departures from the “guidelines” for things like shoulder width, etc. are such a big deal that they generally result in special internal reports to document the special circumstances, and they are accepted only with great trepidation. But cut the shared-use path to half the minimum recommended width? Well, it IS only a guideline, and we kind of thought it sounded like a lot of money to do it right. Next item? While I appreciate that Janette Sadik-Khan is showing some national leadership, and that has value, sometimes I wish she’d spend just a little more time making sure her own borough offices were actually with the program. JK I hope NACTO can evolve fast enough so that it doesn’t take several decades to get where the Northern European countries already were decades ago. Time and money is of the essence. Many cities outside the few progressive and large ones that are regularly featured here probably aren’t even considering things like cycle tracks. I know for a fact from some involvement with my city’s planning (Tallahassee) that the planners are somehow under the impression that cycle tracks are more dangerous and should not be considered. At best they may throw in a few bike lanes or sharrows on certain stretches. I don’t foresee those easily being “upgraded” in the near future considering that funding is always in shortage, especially for non-motorized vehicle traffic and that things like cycle tracks do cost quite a bit more than bike lanes.